Interviews of Helen Kelly in the year before she died are being edited into a movie, due out later this year. A new film about the late union leader Helen Kelly reveals she blamed a fatal bomb attack on anti-union hysteria whipped up by former Prime Minister Sir Robert Muldoon. Ms Kelly said the frenzy led the suitcase bombing left in the building, its explosion killing caretaker Ernie Abbott. In it, she recalls how she knew Mr Abbott well – her father Pat Kelly worked in the hall with him. The movie is based on a series of interviews with the union leader in the year before she died – including one about the 1984 Trades Hall bombing. There is a scene on the bomb attack, based on interview footage released to Newshub, in which Helen Kelly clearly blames it on the environment created by Muldoon, known as ‘Muldoonism’. “Just this absolute sort of anti-Communist, anti-socialist, anti-reds under the bed hysteria which was really designed to shut down trade unions and discredit them,” she said. “It was run by Muldoon – and it was vicious, and people were being forced to be sort of scared of trade unions and to see them as a threat,” she said. It’s quite possible that intolerance and hate whipped up for political purposes at least contributed to the murder of Abbott. This was as bad as the Rainbow Warrior bombing, whether killing someone was the aim or not. The deliberate division and attack methods of Donald Trump could also contribute to something terrible in the US happening, given the number and type of arms readily available there. 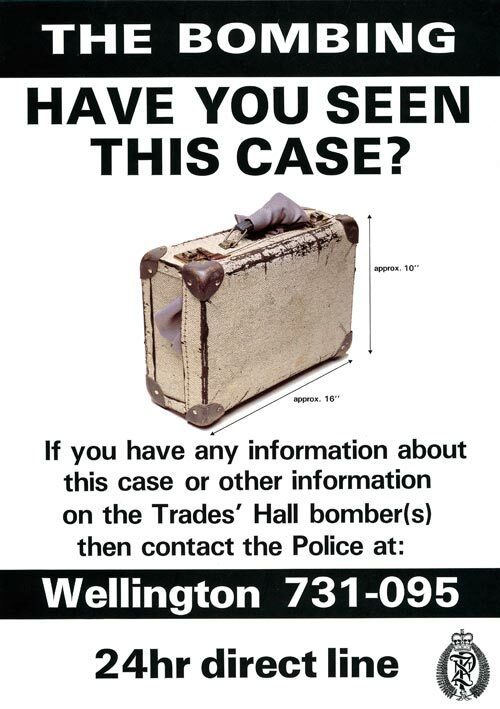 This police poster calls for information on the Trades Hall bombing, at Vivian Street, Wellington, on 27 March 1984. A bomb left in a suitcase killed Ernie Abbott, a unionist and caretaker of the hall. At the time of the bombing Trades Hall was the headquarters of a number of trade unions. The attack came after a period of heightened industrial tensions, during which Prime Minister Robert Muldoon made frequent verbal attacks on the union movement. The bombing remains an unsolved crime, but it appears to have been the action of an isolated individual with a hatred of unions. And so over the past week Peters and his bus have been touring the South Island’s provincial towns. In Invercargill; he promised to nationalise the aluminium smelter; in Gore to compel Government departments to purchase wool carpets and everywhere he promised to return GST to the region where it was gathered. It was pure Muldoonism, and Sir Robert would have been proud of the man he once said would be New Zealand’s first Maori Prime Minister. To get a picture of the relationship between the two you need only look again at National’s campaign ads from the 1978 campaign. They featured a young, devilishly good looking Winton Peters interviewing Sir Robert about great issues of the day like how to bring inflation down to around 10 per cent or how to stop unions going on strike all the time. He still sees Muldoon as someone who had an economic plan that worked. “There were a whole lot of things that were happening under Muldoon when the second oil shock happened in 1979,” he says. But what does he want now? It’s hard to know what Peters really wants. Some of his closest friends believe he still wants to be Prime Minister. John Key recently told a Cabinet Minister that he doesn’t think so. He thinks Peters would sooner sit on the cross benches and hold the balance of power and force the Prime Minister to come and bargain with him on every vote in the House. Key says that way Peters would become the de facto Prime Minister. One thing is probably certain and that is he will stretch any post election negotiaitons he is involved in as far as he can go. There are stories about him continuously upping the ante with Jim Bolger during the 1996 coalition negotiations which saw Bolger trekking back and forth between the Naitonal Caucus room and Peters’ office. But now Peters refuses to discuss his team for any negotiations. But he has apparently recruited his barrister, Brian Henry, to play a role. Whether that imposes order remains to be seen. But maybe we have all been getting Peters wrong for a long time now. Maybe the focus on what he might want — the “baubles of office” or which party he might form a Government with ignores what he is really all about. You have to go back to Dargaville to understand that then and then ask yourself what would Holyoake, or Muldoon have done. Winston’s current slogan on Twitter: “it’s common sense”. Perhaps it’s common sense for those who yearn for the good old days half a century ago. David Fisher has been searching the database of CIA files that has just become available online. It shows that Robert Muldoon sought help from President Ronald Reagan to help him get re-elected in 1981. The papers repeatedly mentioned Muldoon’s appreciation of the relationship with the US and a 1981 briefing from the CIA to the White House showed it was reciprocated. A memo to President Reagan pointed out Muldoon had a “difficult” election that year and the visit to the US was an “opportunity to show the New Zealand people that he is an international leader of some stature who is taken seriously in Washington”. It was suggested Muldoon would welcome an “expression of hope” from President Reagan “that he will emerge victorious”. I don’t know whether Reagan publicly supported Muldoon. He had taken over as US president in January 1981. National won the November 1981 election with a majority of just one after a recount gave them a 150 vote majority in the Gisborne electorate. 1981 was dominated by the Springbok tour, and National campaigned on their ‘Think Big’ policy, but a word from Reagan (if he gave it)may have made a difference. By the time of the key 1984 election, the CIA prepared a full biography of Muldoon. It described Muldoon’s success with NZ’s economy as “limited” but said it had “not deterred him from preaching international monetary reform to world leaders … at every opportunity”. Muldoon’s ‘success’ was less than ‘limited’, his mismanagement and interventions had just about wrecked the New Zealand economy. The country’s economy was in a dire situation when National under Muldoon lost the snap (or schnapps) election in 1984 in a landslide to Labour under David Lange. The CIA also warned that a Labour victory “would create difficulties in the US relationship”. It was also concerned at the resurgent nuclear-free movement which was being pushed by Labour. Self interest. The nuclear ships ban that eventuated led to the US creating difficulties for themselves in their relationship wit New Zealand, pretty much out of spite. “Unable to come up with policies of its own to cure New Zealand’s economic ills, Labour sees political benefit in identifying with a fear of nuclear contamination that is widespread and growing in New Zealand and which spans the political spectrum,” the CIA report stated. So Labour duped the US just as they duped the New Zealand voters. Before Lange was sworn in a foreign exchange crisis arose. The NZ dollar was overvalued and following the announcement of the snap election in June traders started selling it off on the assumption that Labour would win the election and devalue the currency. Muldoon refused to follow Lange’s instruction to devalue the currency, making the dollar’s situation more untenable, but eventually relented. Lange’s government had to deal with a severe balance of payments crisis as a result of the deficits fueled by Muldoon’s two-year freeze on wages and prices and his maintenance of an unsustainable exchange rate. This prompted the incoming Minister of Finance Roger Douglas to launch into economic reforms that were largely successful in starting a cure of New Zealand’s economic ills (Muldoonitis). It would be interesting to know whether it was common for New Zealand politicians to seek public support from US presidents in our elections, and whether any presidents openly chose sides. The CIA has just put a large database of documents online. This includes things like the declassified President’s Daily Briefs (PDBs) from the Nixon and Ford presidential administrations. It also has documents related to New Zealand. David Fisher has done some searching. …reveals internal Central Intelligence Agency reports which detail the inner workings of New Zealand political parties, briefings on our Prime Ministers and the times we have upset the most powerful nation in the world. Among the 13 million pages of records are almost 4000 CIA documents which reference New Zealand, dating from as early as a 1948 report on US claims to islands in the Pacific. The bulk of the CIA’s previously top-secret reports come from the 1970s and 1980s with a strong focus on New Zealand’s move towards becoming nuclear-free. The most recent report discovered by the Herald is from 1988, when the CIA wrote of its perceived increase in “racial tension” as a result of Waitangi Tribunal findings. The CIA’s belief former Prime Minister David Lange accidentally backed himself into a corner on the nuclear-free issue, and US concerns the policy could spread throughout the Pacific. While it stated that “Lange has privately assured US officials that he is personally satisfied that nuclear propulsion is safe” and it was weapons over which he held concerns, the CIA stated that Labour’s policy appeared to cover both. A report after Lange became Prime Minister blamed “his penchant for speaking off the cuff in press interviews” which had “inched him into a trap from which he could not extricate himself”. The CIA believe that sank Lange’s expectation the US would be forced to compromise on his terms. The revelation that New Zealand’s nuclear free stance – for which we were punished for decades – didn’t make any difference to the US from a military perspective. This isn’t surprising, the nuclear issue was mostly political posturing from both New Zealand and the US, although it was important for New Zealand as being prepared to hold our ground against the attempted coercion of a super power. A detailed biography of former Prime Minister Sir Robert Muldoon and detailed accounting of his pro-US sympathies, including that Muldoon saw himself as a world leader in financial leadership despite “limited achievements” at home. In a 1978 report, Muldoon was described as “second to none in his high regard for the US” who believed “more than his predecessors” that NZ needed the US for security. However, with “characteristic bluntness” Muldoon had told the US that he felt it did not do enough to balance out NZ’s contribution to the Anzus relationship. A McCarthy-era report into communism in New Zealand – a concern which was present throughout the documents into the late 1980s. Pervasive through the reports was the CIAs fear that Soviet Russia would take advantage of the situation, with reports detailing suspected communist activity across the Pacific and inside the Labour Party. More in Muldoon sought Reagan’s help in NZ election.